Author(s): Manuel Martinez. Centro de Biotecnología y Genómica de Plantas, Universidad Politécnica de Madrid, Campus Montegancedo, 28223-Pozuelo de Alarcón, Madrid, Spain. In recent years, the genomic sequence of numerous plant species including the main crop species has been determined. Computational tools have been developed to deal with the issue of which plant has been sequenced and where is the sequence hosted. 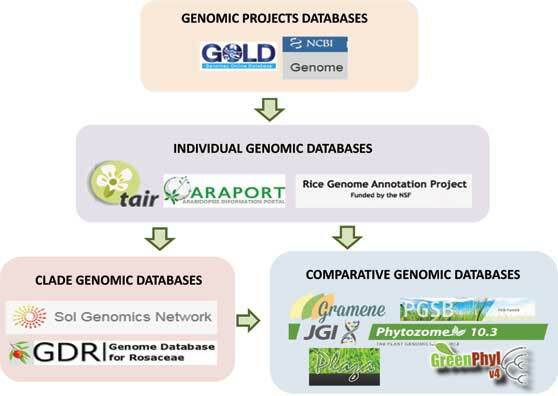 In this mini-review, the databases for genome projects, the databases created to host species/clade projects and the databases developed to perform plant comparative genomics are revised. Because of their importance in modern research, an in-depth analysis of the plant comparative genomics databases has been performed. This comparative analysis is focused in the common and specific computational tools developed to achieve the particular objectives of each database. Besides, emerging high-performance bioinformatics tools specific for plant research are commented. What kind of computational approaches should be implemented in next years to efficiently analyze plant genomes is discussed. Keywords: Comparative genomics, Computational tools, Genome databases, Genome projects, Plants. Affiliation:Centro de Biotecnología y Genómica de Plantas, Universidad Politécnica de Madrid, Campus Montegancedo, 28223-Pozuelo de Alarcón, Madrid, Spain. Keywords:Comparative genomics, Computational tools, Genome databases, Genome projects, Plants. Abstract:In recent years, the genomic sequence of numerous plant species including the main crop species has been determined. Computational tools have been developed to deal with the issue of which plant has been sequenced and where is the sequence hosted. In this mini-review, the databases for genome projects, the databases created to host species/clade projects and the databases developed to perform plant comparative genomics are revised. Because of their importance in modern research, an in-depth analysis of the plant comparative genomics databases has been performed. This comparative analysis is focused in the common and specific computational tools developed to achieve the particular objectives of each database. Besides, emerging high-performance bioinformatics tools specific for plant research are commented. What kind of computational approaches should be implemented in next years to efficiently analyze plant genomes is discussed.